In On June 24, 1861, the first Vermont soldiers who enlisted for service in the Civil War for three years left Burlington for Washington by rail. Four days earlier, the 866 officers and men from across the state had been mustered into the Union Army under Colonel Henry Whiting at the county fairgrounds. Company G was recruited mainly in Chittenden County. By autumn, the 2nd Vermont had been joined in the war zone by the 3rd through 6th Vermont. These five regiments were then formed into the Vermont Brigade that fought with distinction in many battles during the war. 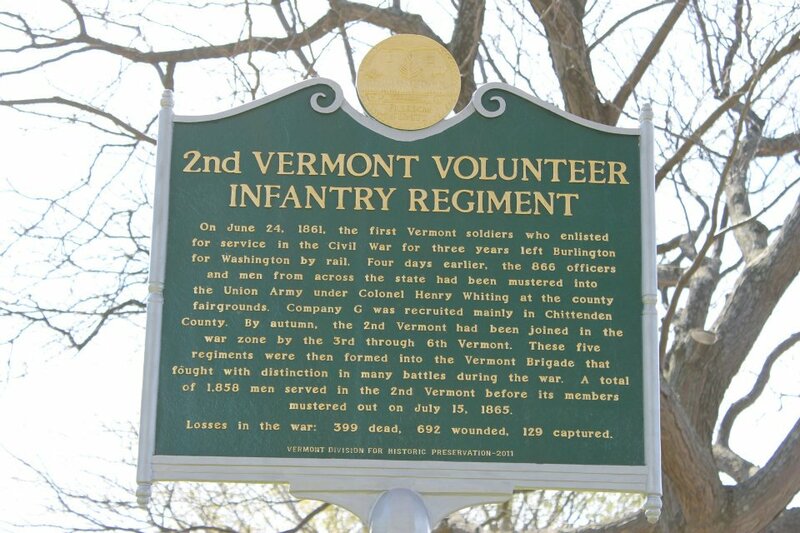 A total of 1,858 men served in the 2nd Vermont before its members mustered out on July 15, 1865. Losses in the war: 399 dead, 692 wounded, 129 captured.